Social media is one of the most effective marketing channels to build your brand. It was reported that 90 percent of B2B businesses experienced increased exposure from social media. Not to mention, 72 percent of a brand's Twitter followers are likely to make future purchases from that brand. And, 66 percent of business-to-consumer brands see Facebook as an effective marketing platform. We created this social media case study to prove that investing in social media marketing is worthwhile. 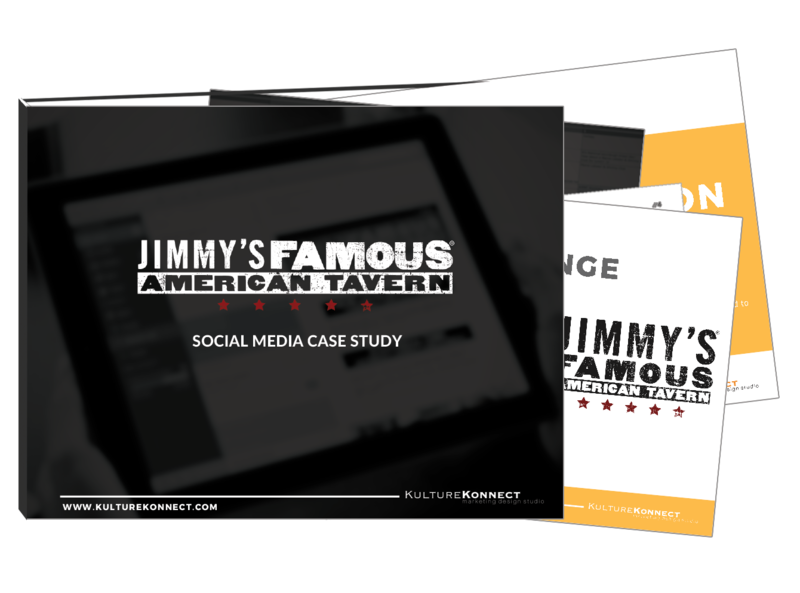 This social media case study tells a success story of how Jimmy's Famous American Tavern (J-FAT) redefined its social media by transforming its brand, accelerating its social media growth, engaging and connecting with its audience, and reaching its business goals with help from Kulture Konnect. After taking over Jimmy's social media, we cannot press further enough how much of a positive impact it has made on their social media growth, which is why we found it be extremely valuable to review your social media strategy periodically to determine if you are meeting your goals and signaling your values. The first step is to work with a marketing and design studio where your social media strategy will receive an audit by professionals to ensure you have all of your bases covered. A year-to-year comparison, highlighting a before and after taking over Jimmy's Famous American Tavern social media. 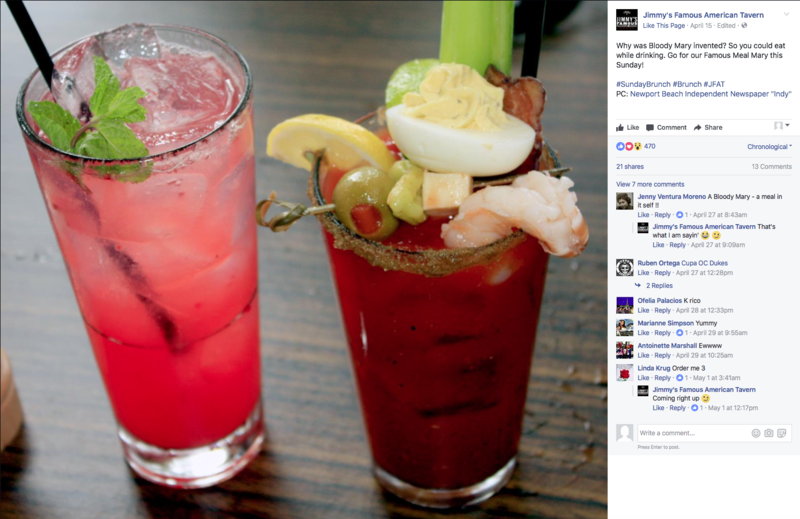 Social media marketing challenges Jimmy's Famous American Tavern faced and solutions. 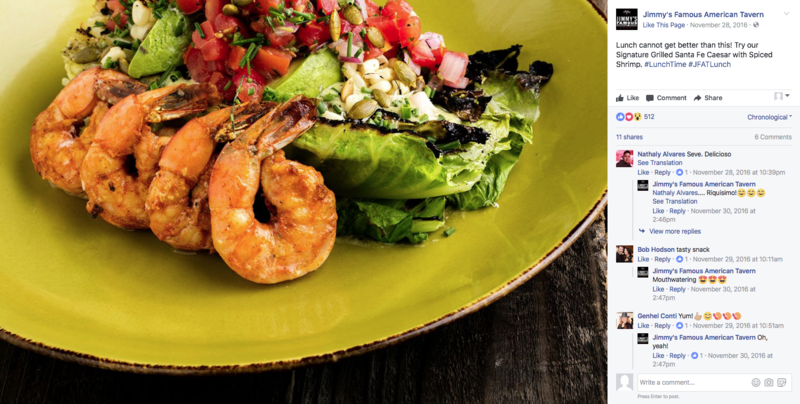 social media case study here! 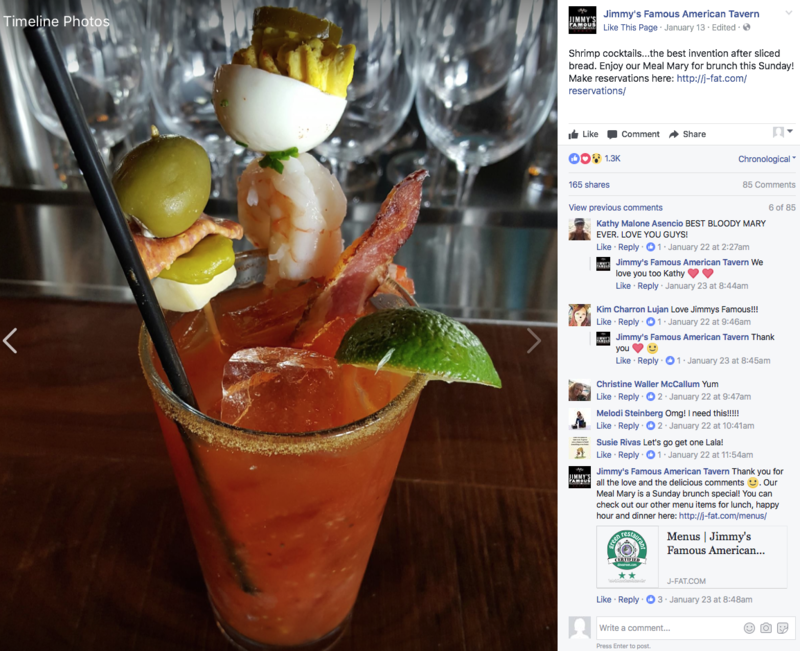 Click on the examples below of several successful Facebook posts Kulture Konnect created for Jimmy's Famous American Tavern. 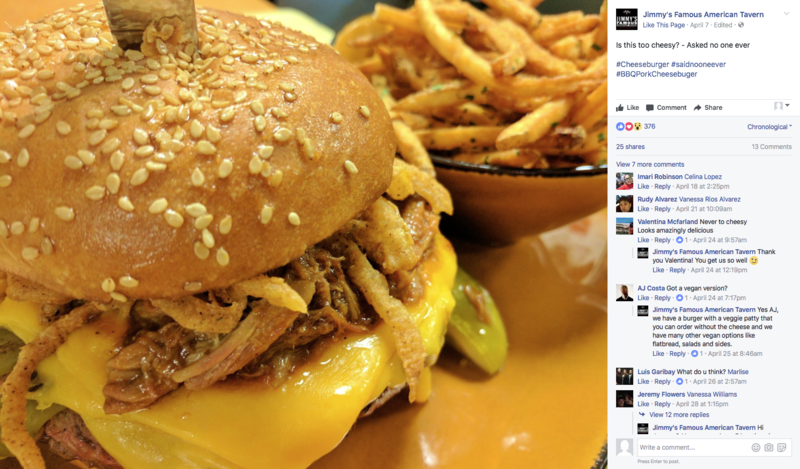 Before Kulture Konnect took over Jimmy's Famous American Tavern's social media marketing, there was a disconnection between all of J-FAT's social media platforms. Profile artwork, general messages and strategy as well as user interactions had no direction. Emails were sent blindly and without a specific objective. Kulture Konnect was brought on board to manage Facebook, Twitter, Instagram and Google Plus. A substantial increase in terms of analytics involving Facebook, Twitter, Instagram and Google Plus. This is a very small glimpse into a comprehensive social media marketing case study, which we have developed just for you. If you are starting the process or you're in the middle of your social media marketing strategy and not sure how to strategize your social media marketing or online presence, contact us! Jimmy's Famous American Tavern today!